Here’s a quick follow-up on the pocket-size Baron Fig Apprentice notebooks that I had ordered a couple of weeks ago and mentioned in my review of the company’s larger Confidant notebook. As confirmed before my purchase, the paper used in both notebooks is exactly the same, so you can read the full review of the Confidant for my impressions. I’ve been using an Apprentice (the limited Time Travel edition) for the past week as my catch-all notebook/sketchbook – a place to put sketches when I don’t have my regular sketchbook with me or when I need a smaller format to be discreet. 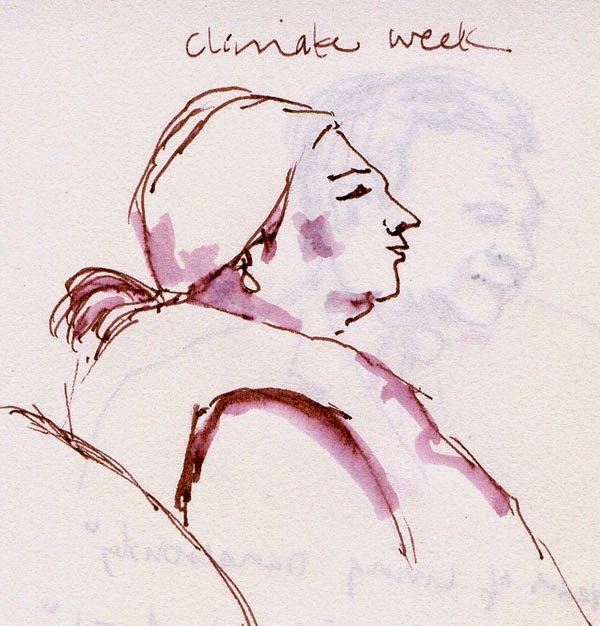 Earlier this week I attended a presentation on climate change (which included a screening of the excellent and disturbing Showtime documentary, “Years of Living Dangerously”). 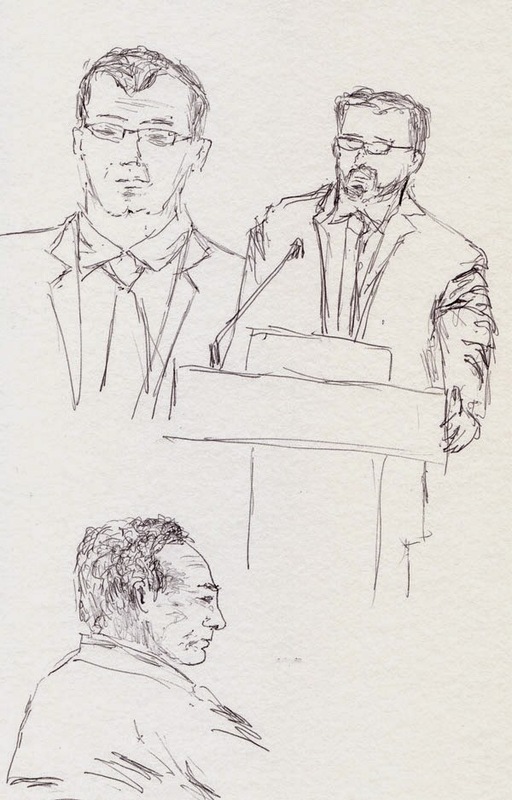 During the open forum portion when audience members spoke, I decided I could listen better if I sketched at the same time (as I’d discovered previously). Pulling out the little Apprentice was just right: Small and discreet, it probably looked like I was taking notes, not sketching. As expected from my experience with the Confidant, the smooth yet not-too-smooth paper is a pleasure to use with a fountain pen. Also expected was the significant show-through on the reverse side. I like the thin, small format as well as the paper surface enough that I had toyed with the idea of using the Apprentice as a travel sketchbook (a role played by a Rhodia notebook most recently). Unfortunately, the show-through is a deal-breaker; I need more substantial paper if it’s going to travel with me. Maybe I’ll get my expressed wish, and Baron Fig will come through with a heavier paper! 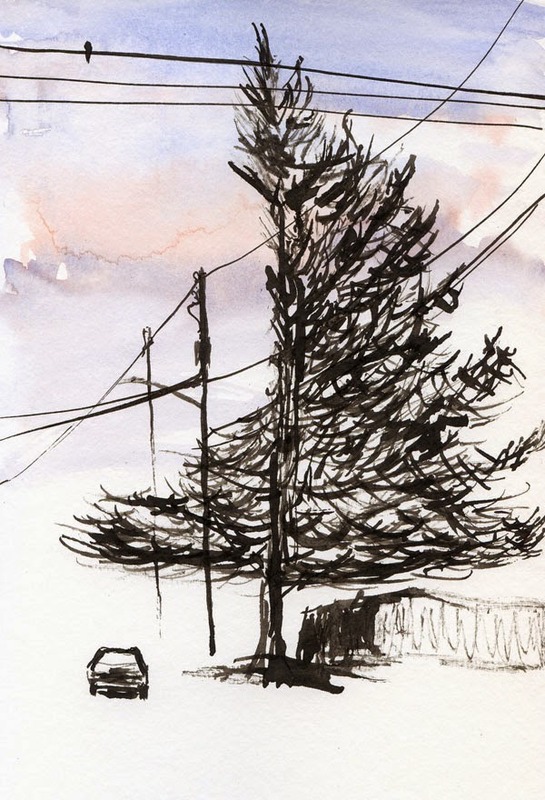 I haven’t been finding as many empty nests as I thought I would when I first started this series of sketches, so when I spotted this one on my way through Greenwood, I made a quick stop. 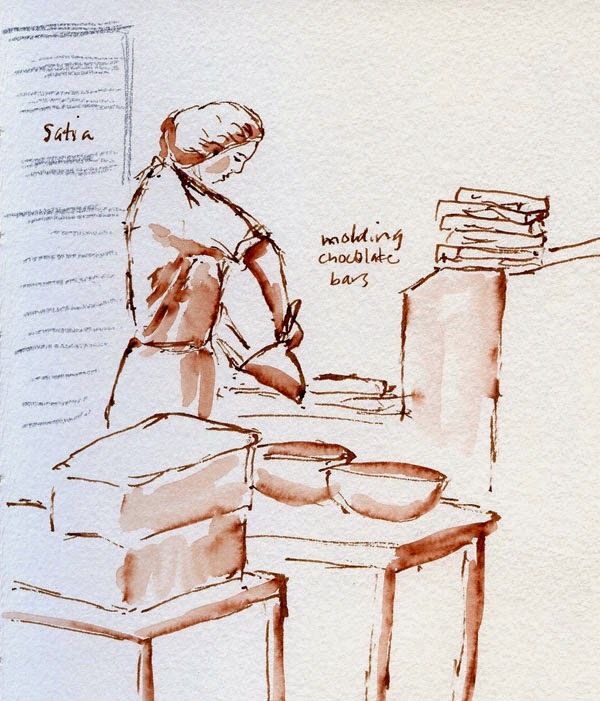 On the covers of my December – January sketchbook are sketches of the Haller Lake Baptist Church and one of the ladies making delectable chocolates at Fran’s Chocolates. You can see that the first signature is made of black paper containing my sketch of the Christmas ship at Ballard Locks and a few others. I didn’t fill the signature, so I have a few blank pages in there, too. Jan. 23 was National Handwriting Day, and I had intended to say something about it but didn’t have a story in mind. I’m a week late, but I finally thought of a relevant hook. I’ve mentioned previously that I use bits of torn-up letters, school work and other old papers with handwriting on them as the collage background for my sketchbook covers. 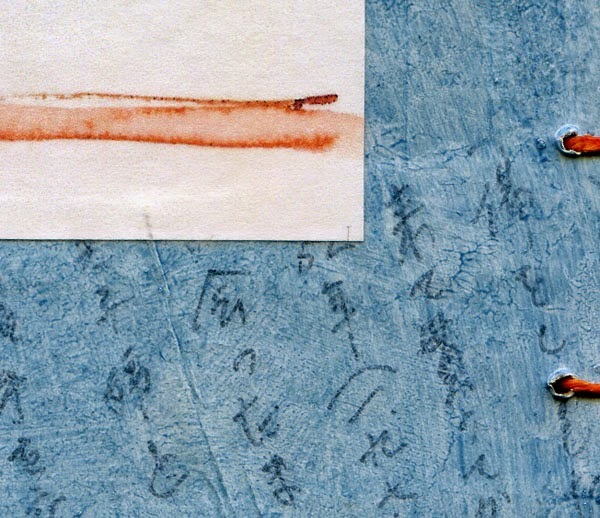 In this close-up below, you can see the Japanese writing of a letter my uncle had written to my mother years ago. She had saved everything, especially handwritten letters, and I found all of it when I cleaned out my parents’ house after she died. I was left with this dilemma: Store it all for the next several decades, just as she had? I didn’t want that burden; it turns out that I had inherited her penchant for saving handwritten letters, so I had my own stash of stuff to store. And yet I didn’t have the heart to throw it all out, either. I eventually made a body of work of collages incorporating old handwritten papers (the artist statement is on my website), so that took care of my dilemma. I could get rid of the stash (hers and my own), but the handwritten papers would be reused in a creative way. I now use the same process for the sketchbook covers. So here’s the “secret” about the covers: After I had moved out on my own, my mom had written me many letters, and I store them all in a box separate from the rest of the stash. Sometimes when I miss her, I randomly pick one from the box to read. She was also famous for sending out very brief postcards even to local friends – almost like texting! – when she had only a bit of information to convey, because she didn’t like making phone calls. I have a number of postcards like this also, containing nothing more than a confirmation of an appointment or an address I had asked for. 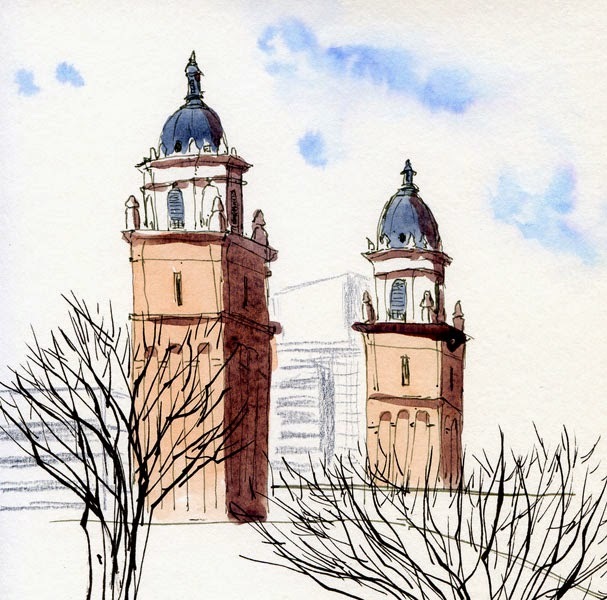 Above the sketch is a fragment of a postcard from my mom. Although anything with her handwriting feels precious to me, these brief, perfunctory postcards seem more dispensable than actual letters. 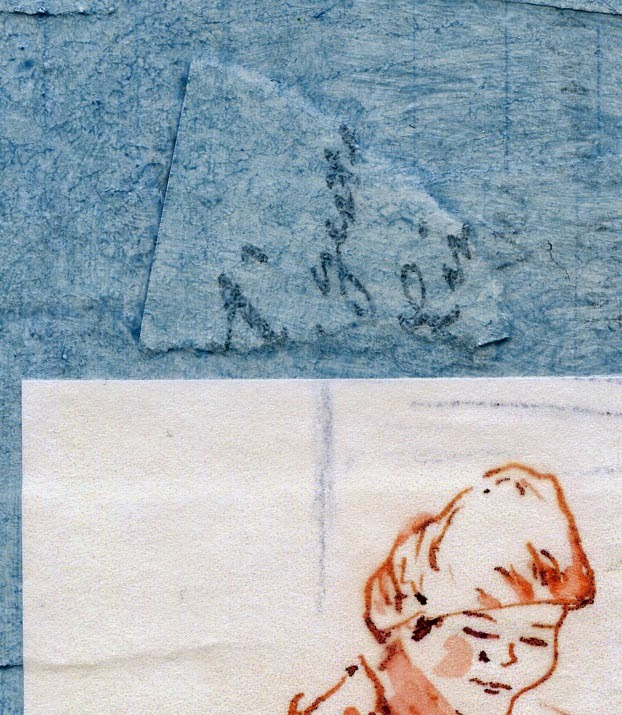 Lately I’ve been scanning their contents and then tearing them up for use only in my sketchbook cover collages – one piece per cover (close-up at left). 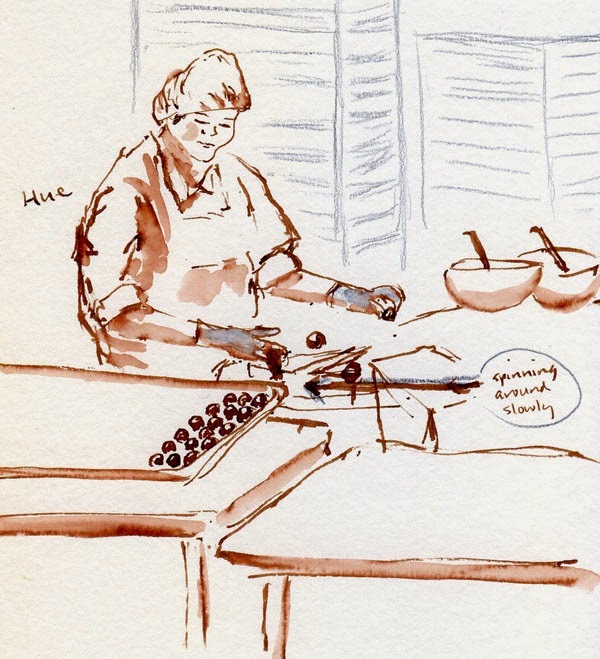 I like the thought of a tiny piece of my mom’s handwriting being a part of each sketchbook. A pragmatic woman, she would have applauded my reuse of the paper. 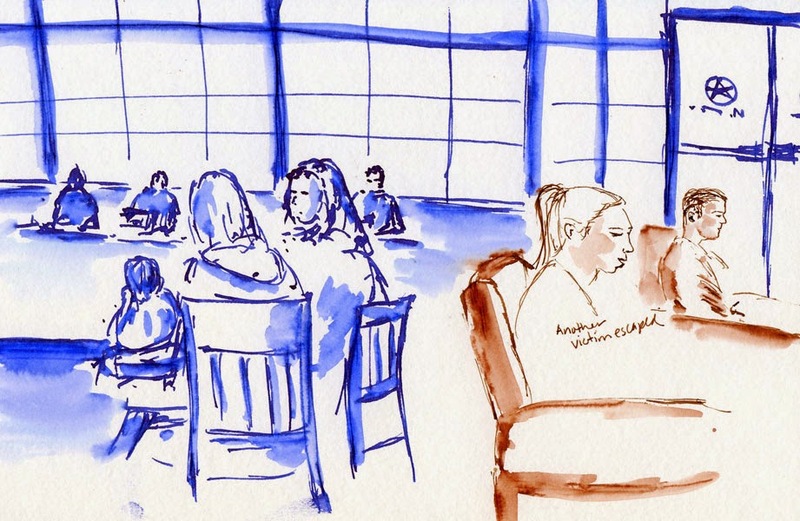 I could have gone to life drawing at Gage, but instead I went to real-life drawing at Zoka Coffee. Unlike paid models, my unwitting models at Zoka tend to come and go as they please. 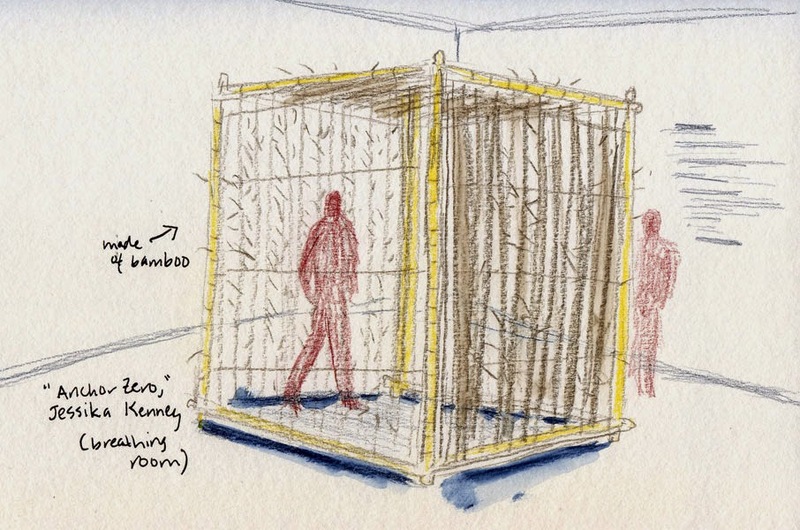 If I expect to complete a whole sketch of an individual, it’s likely that I’ll be frustrated. So I learned long ago that it’s fine to leave their ghost on the page and carry on with the sketch. 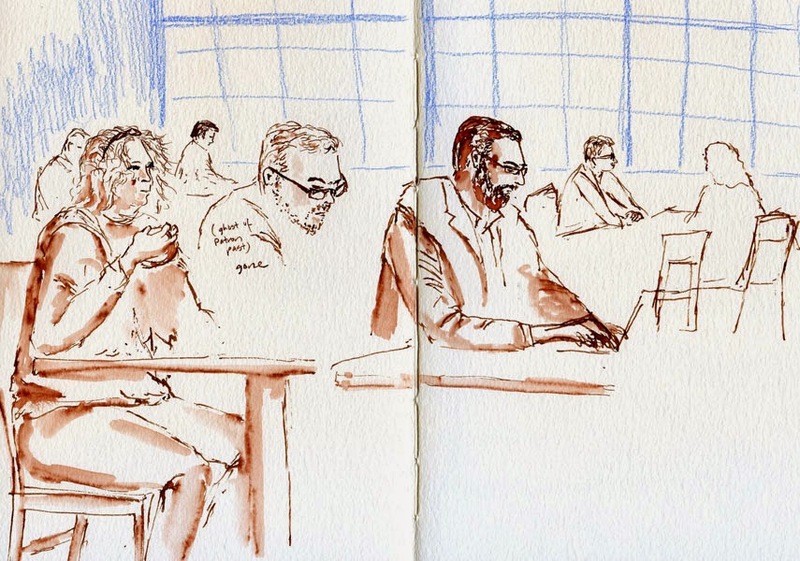 Technical note: I’ve been using Canson XL 140-pound paper consistently in my handbound sketchbooks for well over a year because it gives me the best balance between the weight and the degree of tooth, and the price is reasonable. I recently bought a new package of it, and the paper has changed! One side is much toothier than the other, and I really noticed the difference with my fountain pens today – its texture was rough enough that my nibs were snagging at times. Dangit! As many other sketchers and artists have discovered, as soon as we find a product we like, it changes! Aauuggghhh! In Shoreline early this morning to drop something off at a client’s office, I saw that a faint hint of peachy-pink still tinted the clouds. I quickly chose a tree to silhouette against that sublime sky. 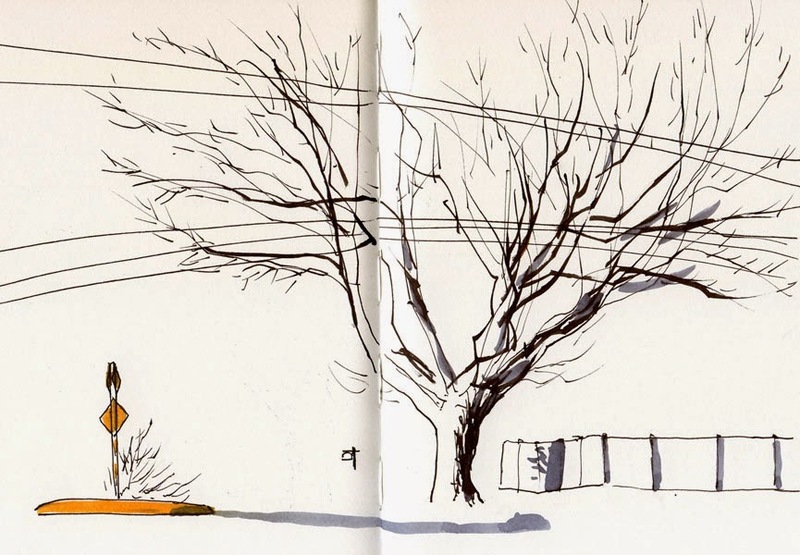 This may be one of my favorite chopped-tree-with-power-lines sketches due mainly to that bird that appeared briefly on the wire. Usually if I sketch a distant bird, I make the mistake of showing it in profile, inevitably making the beak disproportionately large. With a blunt twig in my hand, I knew I wouldn’t be able to make a fine enough mark to draw the beak, so with quick stroke, I sketched it from the back instead. 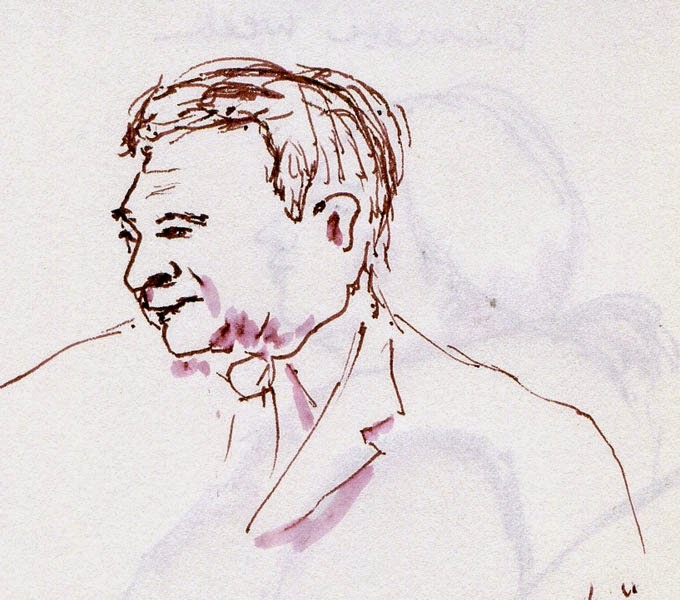 Yesterday I was given a unique opportunity: My yoga instructor, Fran Gallo, invited me to sketch during one of her classes. 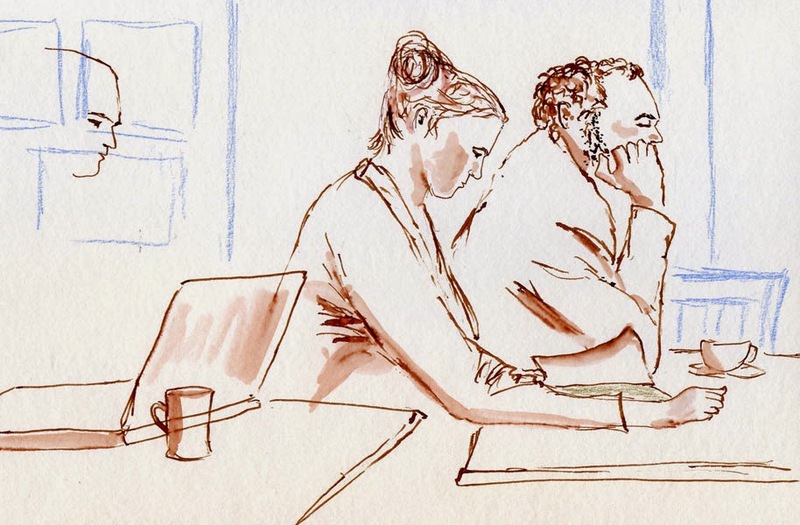 When I’m taking Fran’s class myself, I have often thought that sketching the other students would be an interesting life drawing exercise, so I was thrilled when Fran suggested it. 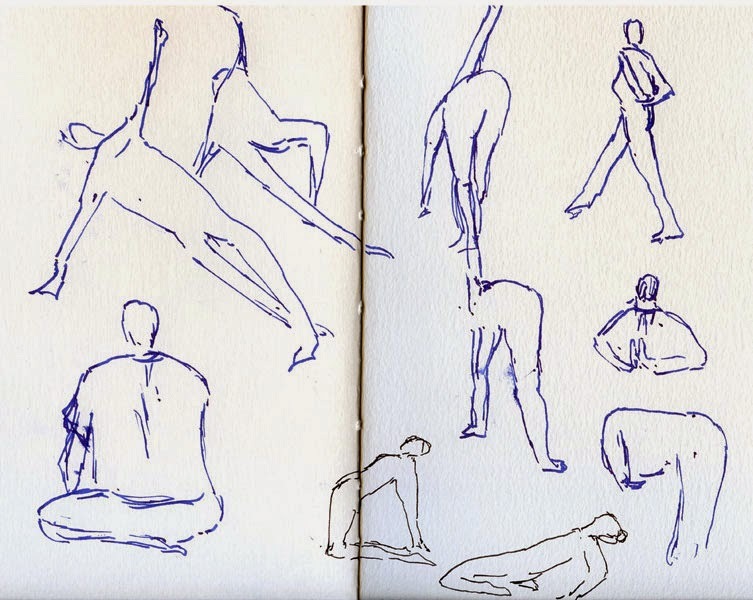 It seemed like the short-pose life drawing sessions I attend at Gage would have been good training for sketching at yoga, and they were – to some extent. But the shortest pose the models hold at life drawing is one minute. 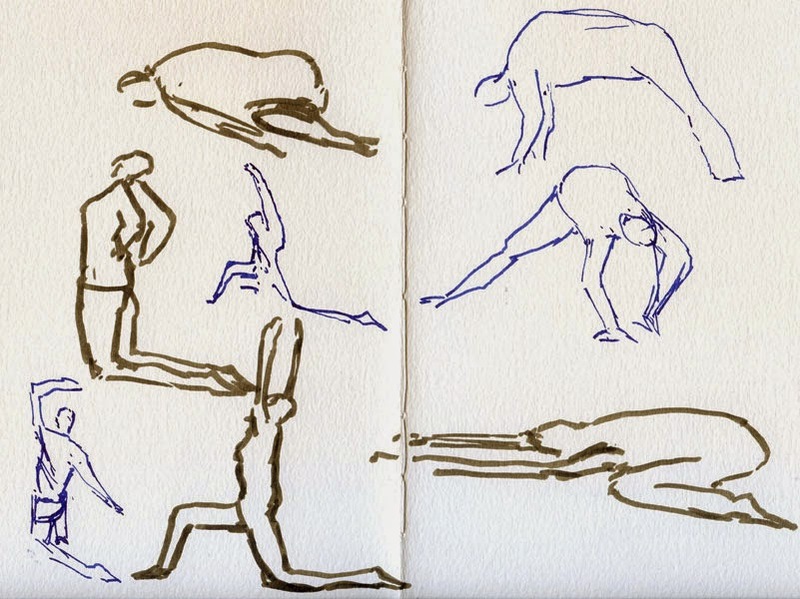 In Fran’s class, the students hold some strenuous, challenging poses for a lot less than a minute – perhaps 30 seconds or less. Yesterday’s class gave me a workout in speed sketching! 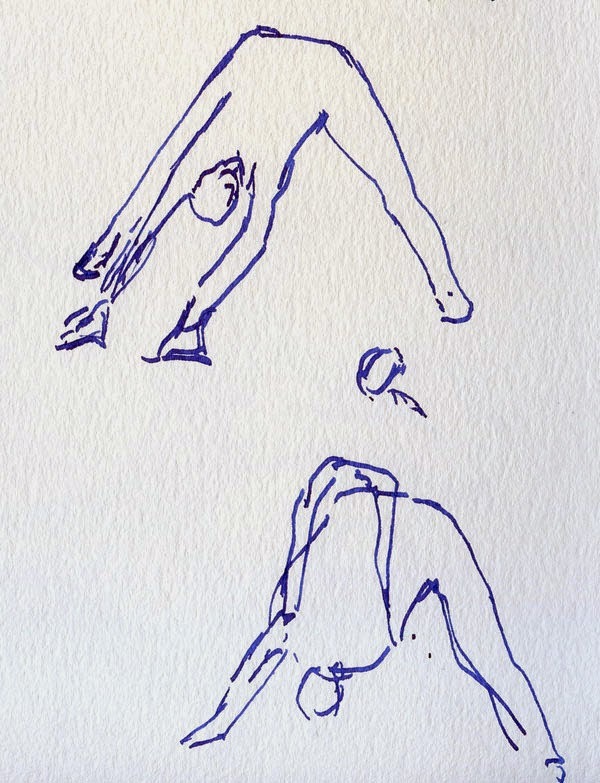 I thought it might help that I practice yoga myself: If I had to visually memorize a pose to finish drawing it, my own body’s memory of the pose should remind me. That’s a good theory, but in reality, it was no less challenging than if I didn’t practice yoga! 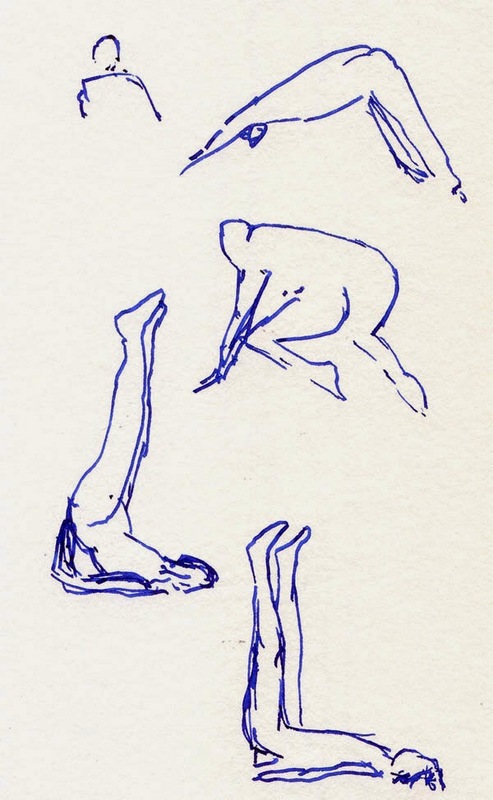 In the past, I’ve used yoga as a metaphor for drawing. I’ll do it again: As I filled 13 pages in my sketchbook during the 75-minute class, I needed the first few pages to warm up and find my flow. 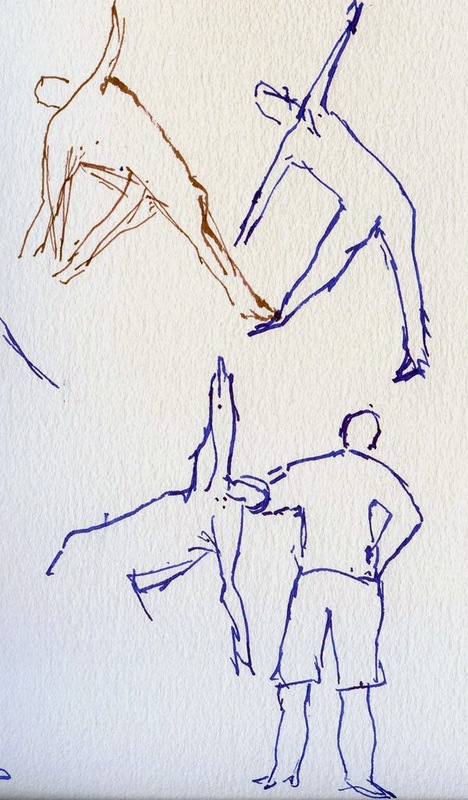 Eventually I did, and the sketches came more fluidly, just as the poses seemed to flow more easily for the students. 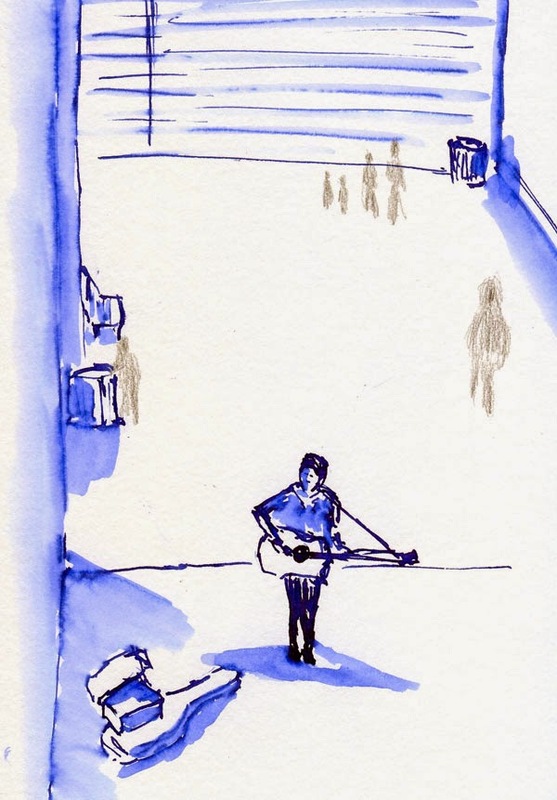 After a while, I got tired, and the sketches weren’t as good, but in exchange I had gained a different kind of energy that comes from close observation and recording what I observe. During the final shavasana, I rested along with the students, feeling calm and strong. Thank you, Fran, for a different type of yoga experience! Technical note: This sketch seemed to demand watercolor only, but I didn’t have quite enough confidence to paint Mt. Rainier’s shape without some kind of line first. 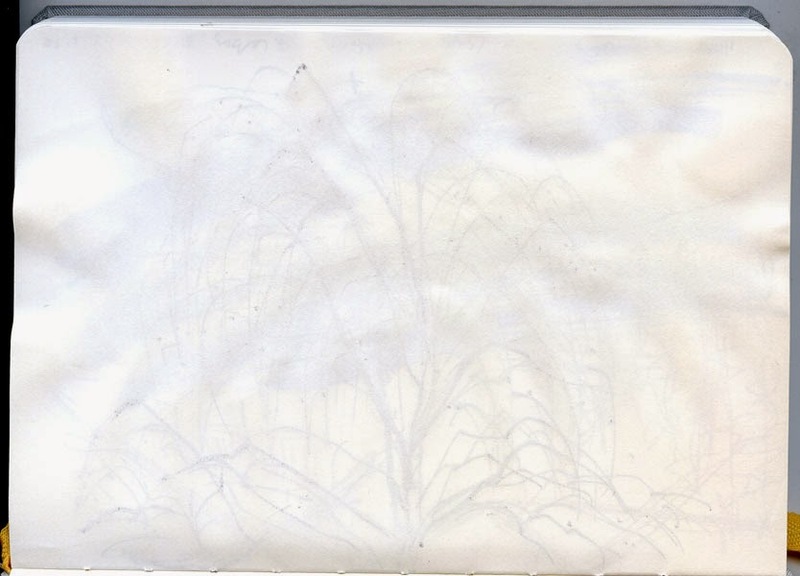 A dark blue water-soluble pencil makes an ideal line – it just dissolves once the paint is applied. Impulse buying is not something I’m known for. (The last time I made a totally impulsive purchase, I came home with a Hello Kitty Pez dispenser collector’s box to hold my then-small ink collection – but who could resist that?). Whether it’s a clothes washer or a can of soup, I tend to read reviews and labels carefully. I do my research. At the same time, I always come out strong as a J on the Myers-Briggs type indicator, which means I’m not comfortable with lots of options, and I prefer to seek closure and resolution rather than keep things open. In terms of shopping, that means I like to make the purchase as soon as I’ve made the decision to buy something. Once I decide, I don’t like continuing to look for more options. All of this is preamble to documenting the epic search-and-discovery mission I have been on since last August that I’m finally ready to begin describing. (It’s going to take me a while, though – I’ve written seven parts so far, which will appear weekly on Sundays.) Six months may not seem epic to you, but for me it is, mainly because of my discomfort with unresolved searches. And as of this writing, the search continues. The object of my search? The grail of variable-line-width fountain pen nibs. Before I get to the search itself, I should explain why such a nib has become so interesting (OK, obsessive) to me. What’s the big deal? What’s wrong with a plain ol’ conventional, single-width pen nib? For my first couple of years as a sketcher, I used mainly single-width writing instruments of various types – first a variety of technical pens (such as one favorite, the Copic Multiliner SP), which are designed to produce a consistent line width, and eventually Lamy and Pilot fountain pens. I was happy with each at the time. 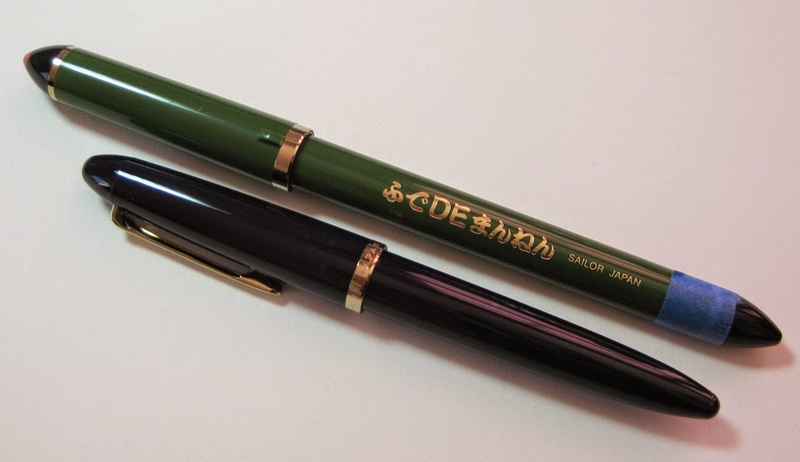 Somewhere in 2013, variable-width writing instruments moved into my radar range, and after trying a few, the first to really grab my attention was the cheap Sailor “calligraphy” pen (with what I now know is the fude nib). Not overnight, but slowly and gradually that pen changed the way I drew by making me more aware of the expressive line – and how a varying line width can be a large part of that expression. 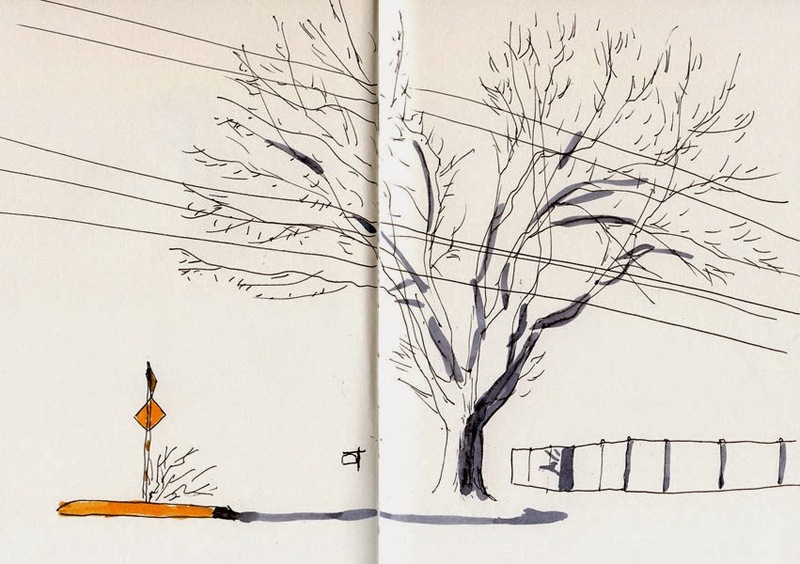 Shown at right are two sketches I made of the same tree in Shoreline as examples. 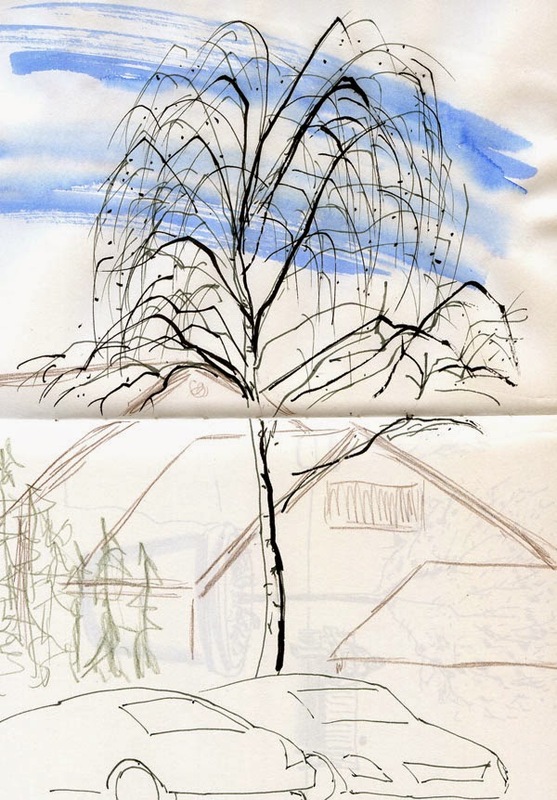 Although I would probably typically add color to the sky and maybe more shading, I deliberately left these sketches minimal to emphasize the line work in the tree. The one on top was made with a Pilot Petit1 fine nib fountain pen – a perfectly serviceable, extremely inexpensive and highly reliable pen with a firm, conventional nib that makes a clean, consistent line. The one below it was made with my trusty Sailor fude. Which one seems to describe more about the tree and, I hope, tells more about how I was feeling about this tree? To me, it’s the one sketched with the Sailor fude. Perhaps the difference between the two sketches is subtle, but it’s a huge difference to me – in the way I feel while I’m sketching. And so the search began. unpredictable) line width I've used. 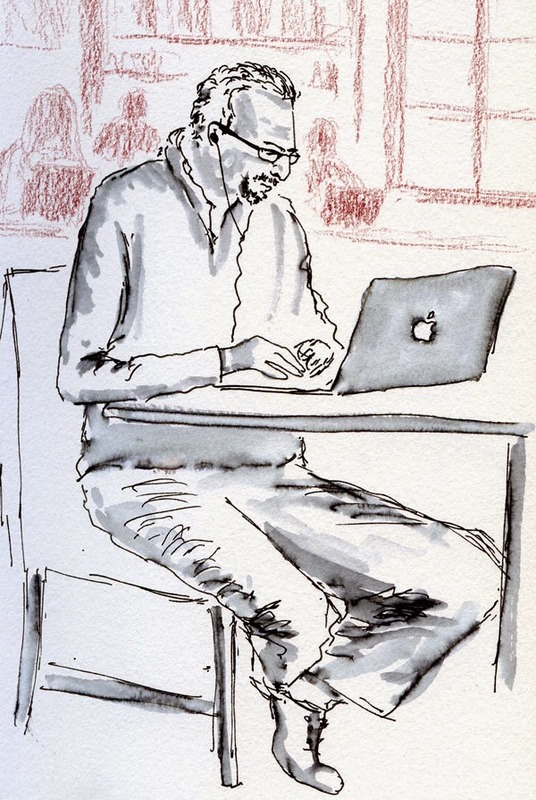 My search started innocently enough in August 2014 when I saw a photo of urban sketcher Mike Daikubara’s (MikeD) sketch kit on Flickr. I spotted a cool-looking fountain pen and asked what it was. 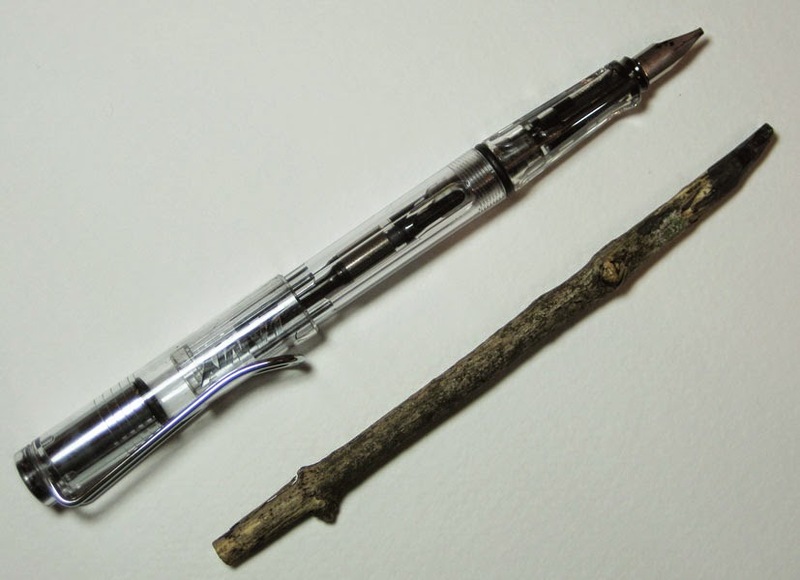 When he responded that it was his “trusty Sailor pen,” the Sailor Transparent Profit 21 Naginata Fude De Mannen, my heart skipped a beat – the Fude de Mannen is the same type of “bent” nib as on my own Sailor pen! 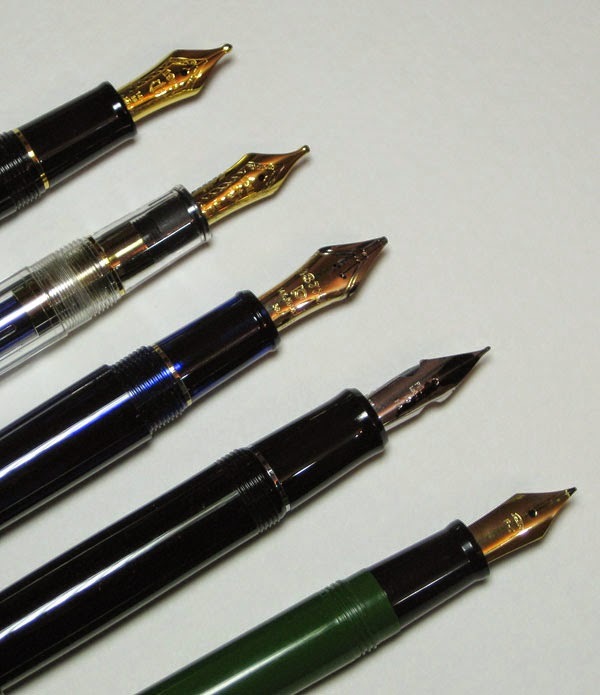 Readers of this blog have heard me refer to “my trusty Sailor pen,” which has appeared on my Top 10 list both this year and last year. I absolutely love the variable line width that crazy nib can make with just a front-to-back tilt, and I’ve been amazed that its price is under $20 (under $10, including shipping, when purchased online at J-Subculture) for such a fantastic pen. My only complaint is related to its plastic body, which, though comfortably lightweight, is a bit too slender, looks cheesy and insubstantial, and posting its cap causes the trim ring on the end to fall off. Even the slightly higher-priced Sailor Profit model, which has the identical fude nib, isn’t much better. I had resigned myself to putting up with the less-than-satisfactory pen body to use this favorite of nibs. 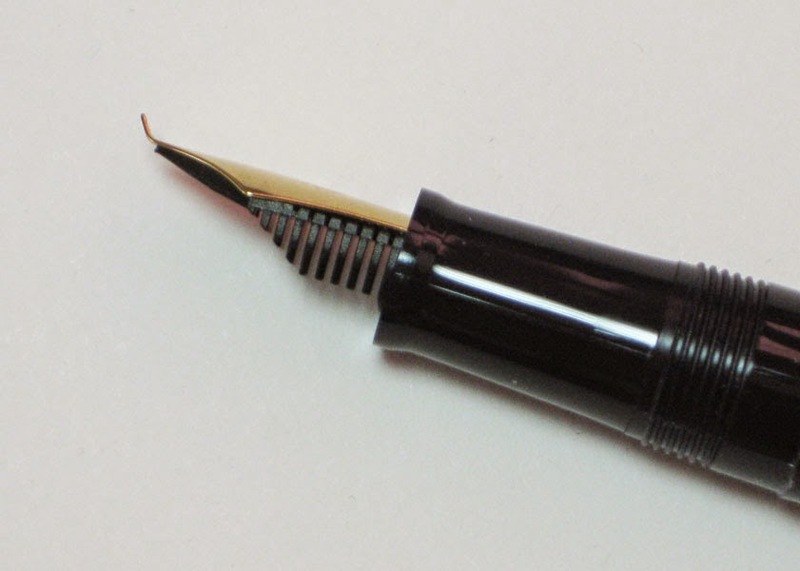 model with the identical fude nib. It had never occurred to me that the same type of nib could be acquired on a better quality body. Seeing that photo of Mike’s much more handsome and higher-quality Sailor with a fude nib turned on the proverbial light bulb over my head. I immediately e-mailed Mike for more information, and that’s when I discovered that the fude is only one of many different types of specialty nibs that Sailor makes. The fude nib itself could be purchased in a 21kt gold version that Mike said is a whole different experience from that of the steel nib I have – the same, but better. It would be the Mother of All Fude Nibs! What’s more, it turns out that Sailor sells outside of Japan only through a few authorized dealers, and the pens with specialty nibs can only be purchased through a third-party vendor. Further research led me to one such vendor, Engeika.com, which stocks a dazzling array of Sailors, including several models that could be custom-made with a fude nib and finessed by nibmaster Nagahara himself – a process that could take up to six months. My grail was still far away but in sight! All I had to do was order. But a funny thing happened on my way to the checkout button. . . (stay tuned next week). We had been invited to a presentation; the topic was of greater interest to Greg than to me. 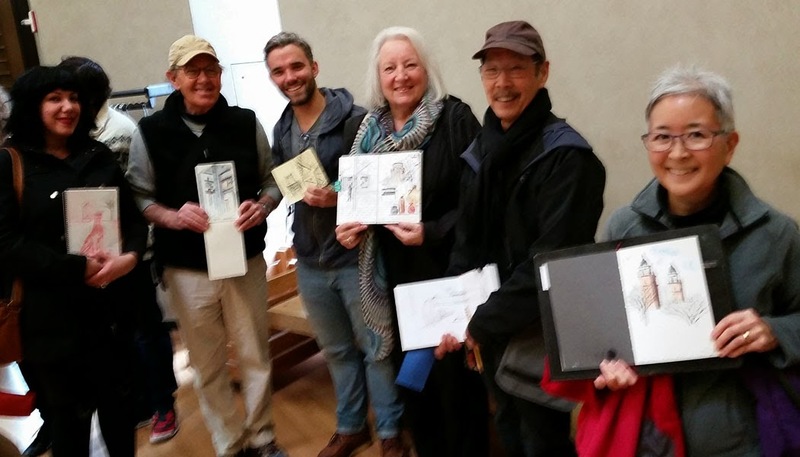 However, free refreshments were promised, so I tagged along – with my sketchbook, of course. At some point I picked up a Bic ballpoint pen that had been provided for note-taking. I know some sketchers swear by the ubiquitous ballpoint for sketching, saying they can get all degrees of value with just one pen, just like some people are able to achieve with a pencil. I’ve never been a fan of ballpoint ink, but I started to see why it’s favored – it’s the kind of medium that you can keep building layers with. I left that pen behind, but now I know that if I’m ever stuck on Gilligan’s Island, I’ll remember to grab a Bic that the S. S. Minnow would certainly have onboard. P.S. 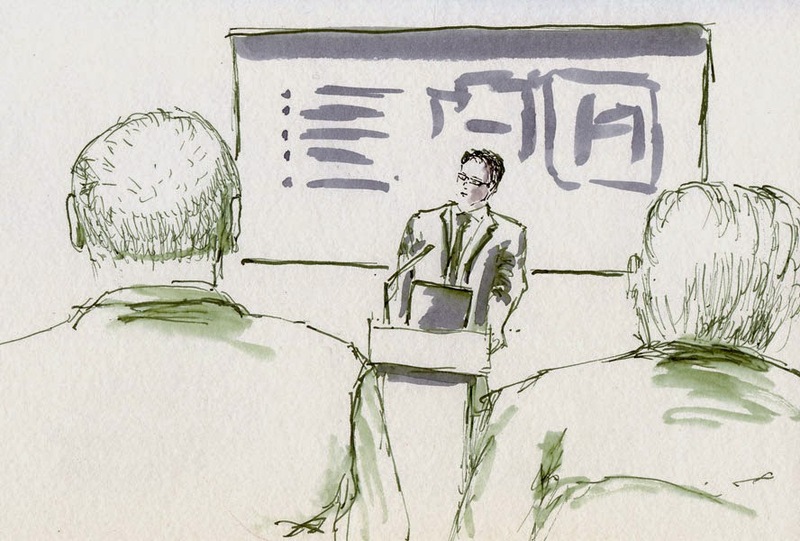 Since I didn’t think I was very interested, I didn’t expect to pay much attention to the presentation while I sketched. I was surprised to find that I retained almost all of it. I find I can’t talk and sketch at the same time, but apparently some part of my brain is able to listen and pay full attention. More than a year ago I supported a Kickstarter campaign for Baron Fig, a couple of guys who wanted to produce a new kind of notebook. I liked their attitude and approach – ask potential users what kind of notebook they want rather than simply duplicate products that already exist. They dared to go against the standard dimensions of the typical A5 notebook, used better paper, made sure the binding opened flat and gave it other features that appealed to me. 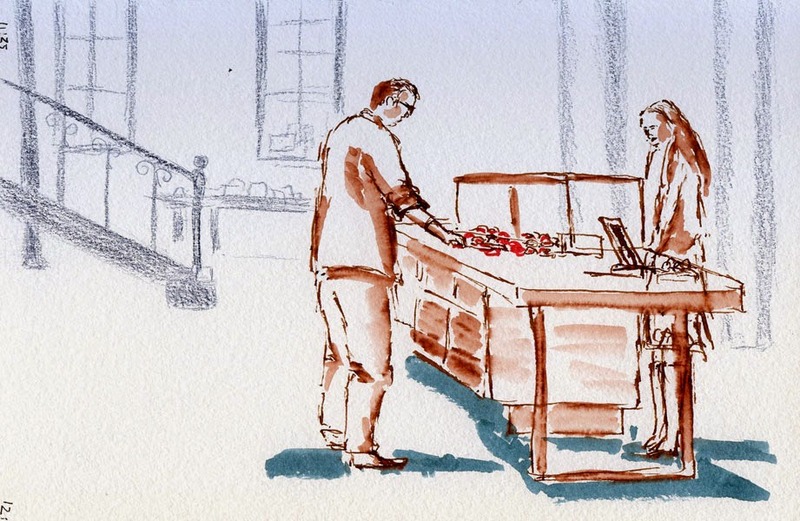 I knew that the notebook’s paper – though fountain pen friendly and 100 gsm – wouldn’t be heavy enough for watercolor painting, and I’m not looking for a replacement for my current sketchbook system anyway. I mainly wanted to support the fledgling company because it seemed like they might listen to customers (which hasn’t been the case with most notebook manufacturers I know of). My intention was to use the hardcover Confidant notebook that I received from the campaign as a journal. As expected, the paper is smooth and pleasant to write on with a fountain pen, and the book’s construction is attractive and seems sturdy. (The Pen Addict and Fountain Pen Geeks have thorough reviews of the notebook with good photos, and many other bloggers have commented on it.) What’s more, the paper is a crisp white (instead of ivory), and the books are available with the option of a plain, unruled page (relatively rare in a vast notebook world that favors all types of ruling over plain). After an initial scribble to test the paper, I put the notebook away for future journaling use. In the year that followed the Kickstarter campaign, Baron Fig became quite successful and put out a few more notebook designs. Since I had a plentiful supply of journals on hand, I didn’t pay much attention. Fast-forward to a couple of weeks ago, when I had a renewed fit of annoyance with Field Notes Brand, a popular maker of pocket-sized notebooks. Maybe my annoyance wasn’t specifically against Field Notes so much as all small notebook manufacturers: Why can’t anyone make a thin, pocket-sized notebook with decent paper? 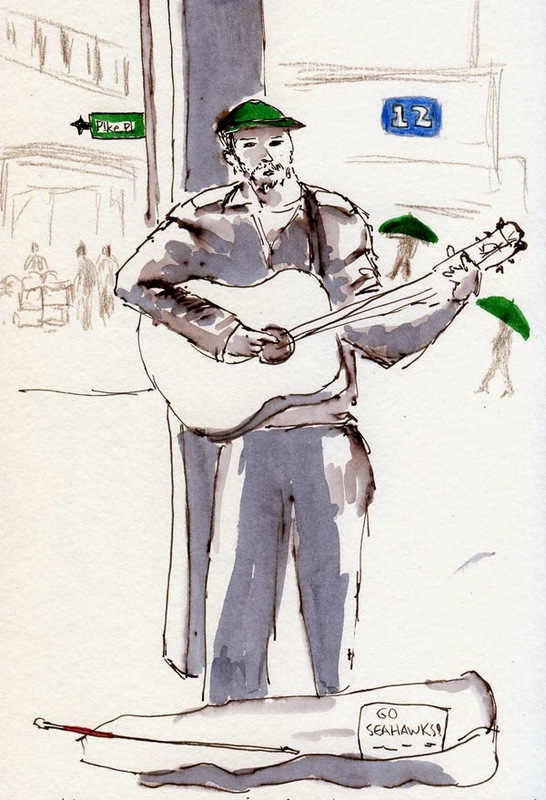 I know it would be too much to ask for full-on watercolor paper (for that, I’m probably stuck with making my own) – but is it too much to ask for paper that could take a light wash from a waterbrush and be heavy enough that there’s no show-through? Maybe 90 or 100 pound (150 gsm)? (My experience with a hardbound Rhodia notebook last summer convinced me that if Rhodia came out with a thin, softcover version using the same paper, it would be as close to ideal as I could expect to get.) 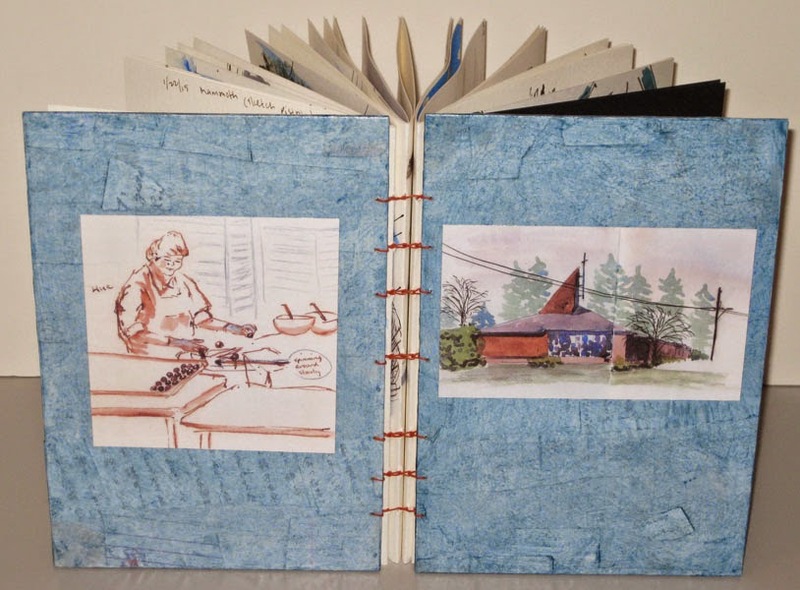 Perhaps my internal rant was directed at Field Notes because last summer it came out with the so-called “Arts & Sciences” series, which gave me high hopes, but even those notebooks had the same paper as the rest – unusable for any kind of sketching. Fast-forward further to the past weekend, when one of the many fountain pen blogs I read raised my awareness of Baron Fig again – this time about the limited “Time Travel” edition of its Apprentice line of pocket-sized notebooks. Curious about the paper, I e-mailed to ask and was told that it is identical to that used in the Confidant notebook I have. Hmmm. . . ! All the many reviews I’d read about Baron Fig’s notebooks were written by fountain pen users, not sketchers. 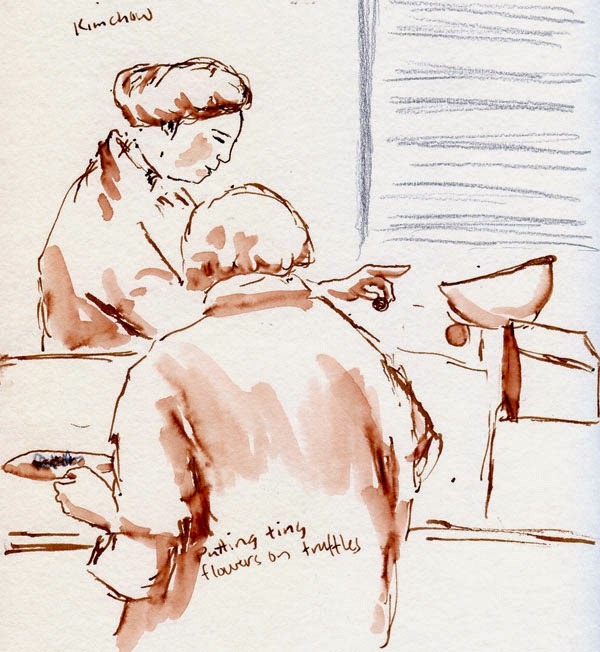 Our needs are not very different – we all want non-feathering, non-bleeding paper with a relatively smooth surface (though I require less smoothness than most fountain pen users, since a bit of tooth is fine and even preferred for sketching). The only additional requirements I have are the ability to withstand a light wash and enough weight that I can sketch on both sides. I decided to give the Confidant notebook paper a sketching workout. 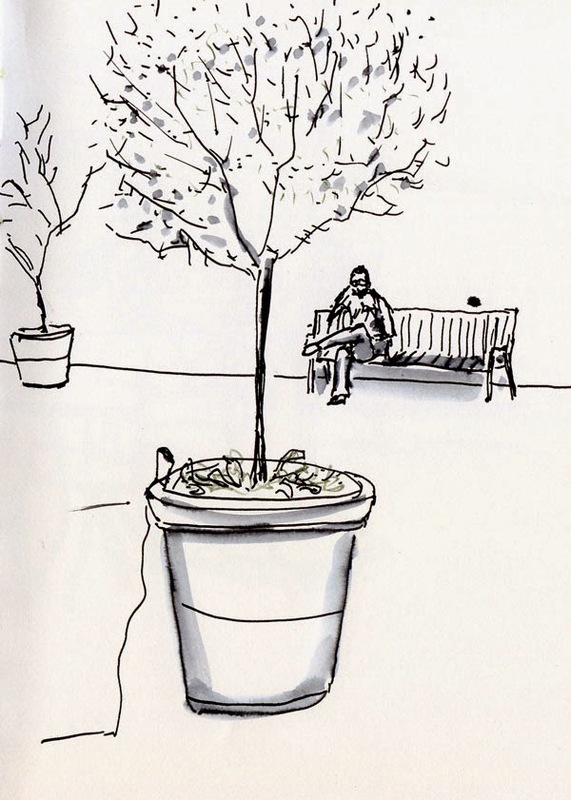 In another sketch (the planter and the man on a bench, above), I didn’t use sprayed water or brush-applied ink – just fountain pen ink lightly washed with a waterbrush. As expected, this time there was no buckling, and the backside (below) shows only a little bleed-through. 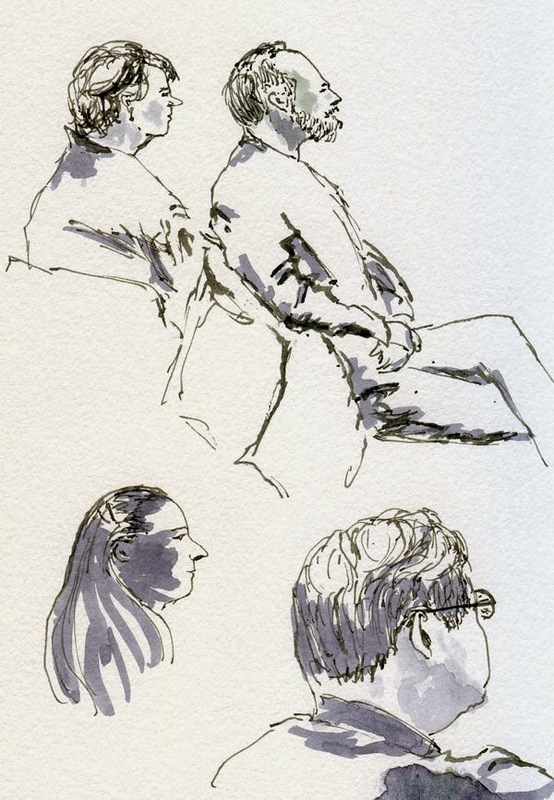 The show-through on the back is more than I would like if I want to sketch on both sides, but it’s no worse than what I experienced with the Rhodia (which is 90 gsm). A pocket-sized version of this paper would be ideal as a travel journal (the Rhodia I used in Brazil, though the right dimensions, was a little too bulky because it was hardbound). It might even be acceptable as a catch-all pocket sketchbook (the role currently served by my handmade sketchbooklets because nothing store-bought serves that need)! If only the paper were a bit heavier, it would definitely be acceptable. To express my enthusiasm for a product that comes very close, I ordered a few pocket-sized Apprentice notebooks to try (I might take one on my next trip). I’ve let them know my paper needs. If you have similar (or other) needs, tell them! Edited 12/13/16: I took a second look at the Baron Fig notebook after I started sketching with graphite! Updated 4/20/17: Baron Fig changed its paper – and I like it even better now! See my follow-up review. 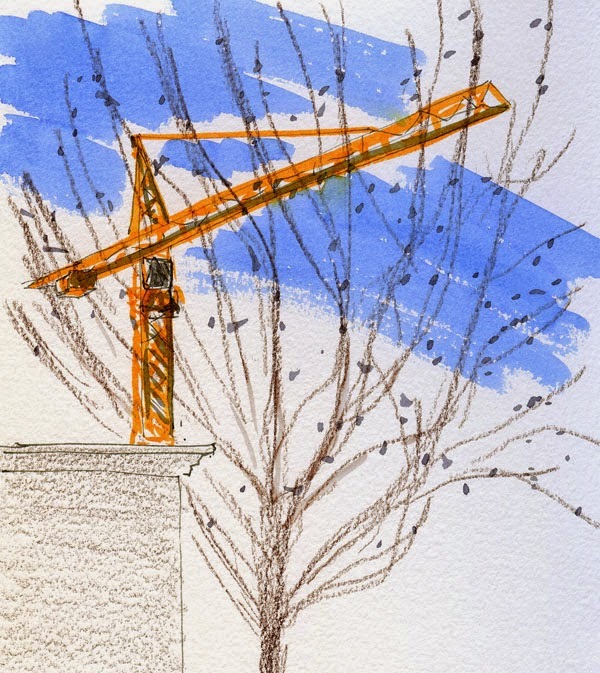 It’s been close to three months since I sketched a Roosevelt Light Rail Station construction crane. 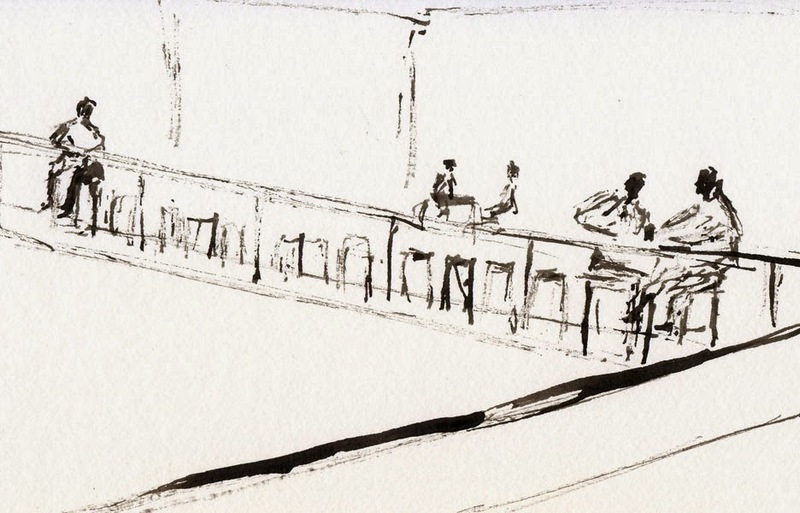 Too cold to stand on the street or even sit at Starbucks’ outdoor tables where I last sketched one, today I remembered that the same Starbucks has a bar-like table against large windows facing the same direction. At a slightly different angle than last time, I gave that view a try. 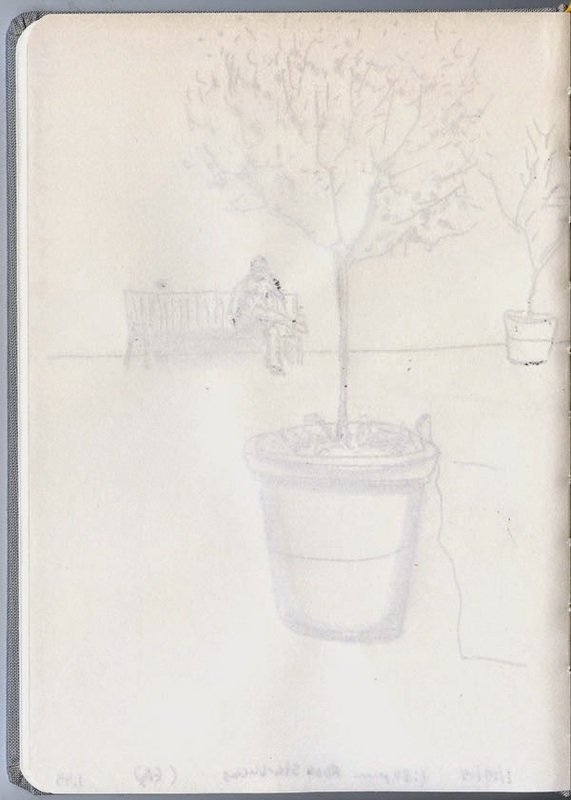 It’s mostly blocked by large trees, but in a few months those same trees will be fully in leaf, obstructing the view even more, so I figured I might as well sketch what I can now. 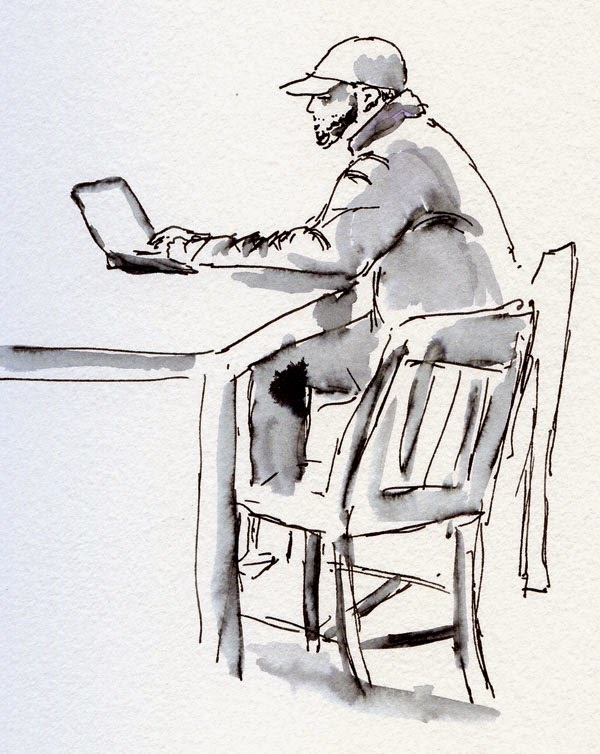 Arriving at Third Place Commons a little early for a meeting this morning, I got a cup of coffee and killed those 20 minutes easily with a couple of sketches. Back in the day before I started sketching (a little more than three years ago), what was I doing to entertain myself during small idle periods like that? I can barely remember. . . I suppose I checked for messages on my smartphone, but before I had one. . . ? What was life like B.S. (before sketchbook)? It was a whole different world – one that was less closely observed, less engaging. Certainly less entertaining. 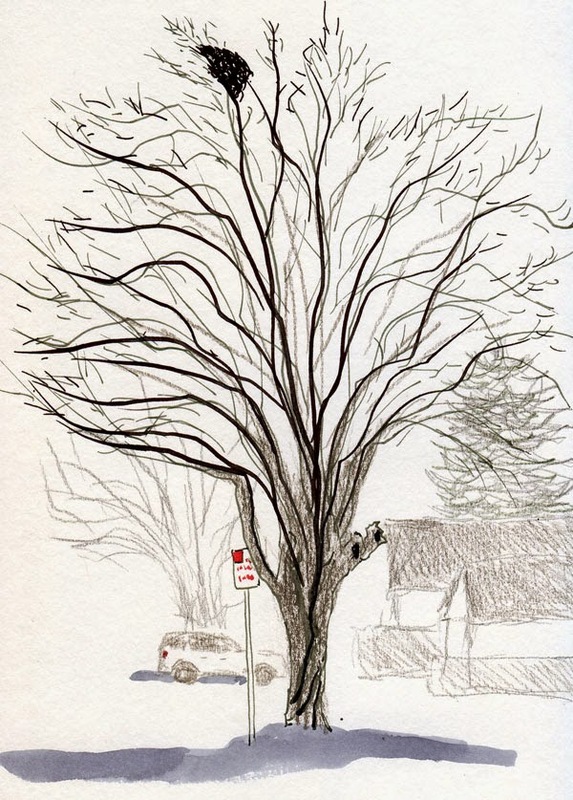 Whether these trees were the victims of disease or over-zealous pruning, it’s hard to say. Tiny twigs were sprouting from some of the haphazardly whacked branches, so maybe they’ll recover someday. Although the sky in front of me was dark and foreboding, behind me the clouds sporadically split apart to let the sun through, and I’d have a few seconds at a time to put in shadows. 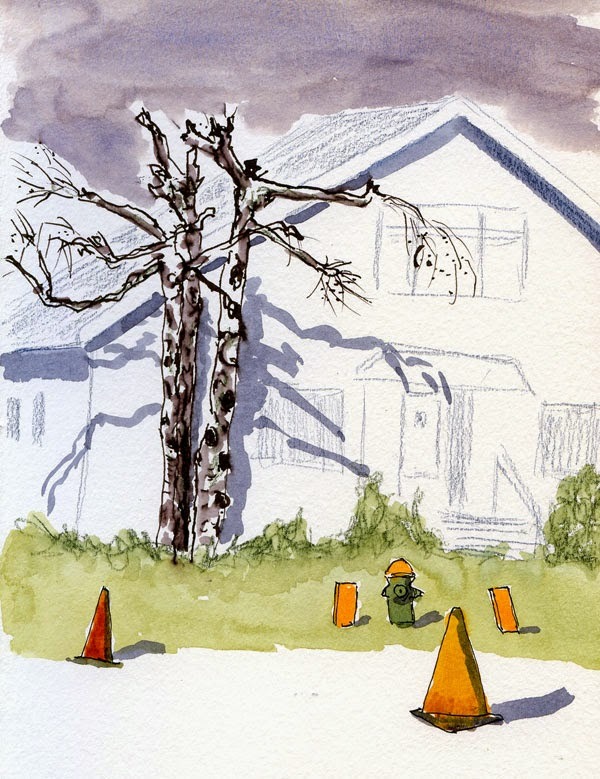 Meanwhile, I don’t know what was going on with the cones in front of the house – I didn’t see any nearby holes, construction or other hazards for them to be marking – but I suppose it’s not the strangest sight I’ve seen in Maple Leaf. 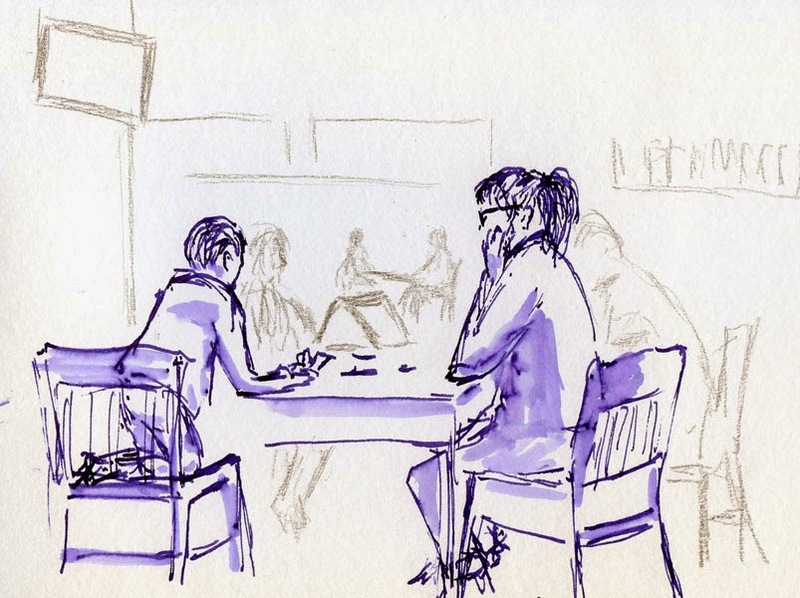 A week ago when I wrote about Bill Evans’ “Quick Sketch” class at Gage Academy, I noted that even during the course of a couple of hours of sketching practice, he said he can see his own sketches improve from the first to the last. I experienced my own version of the same thing this morning at Gage life drawing. It had been more than a month since I went to a short-pose session, so I started out cold and stiff (not unlike getting out of bed every morning). 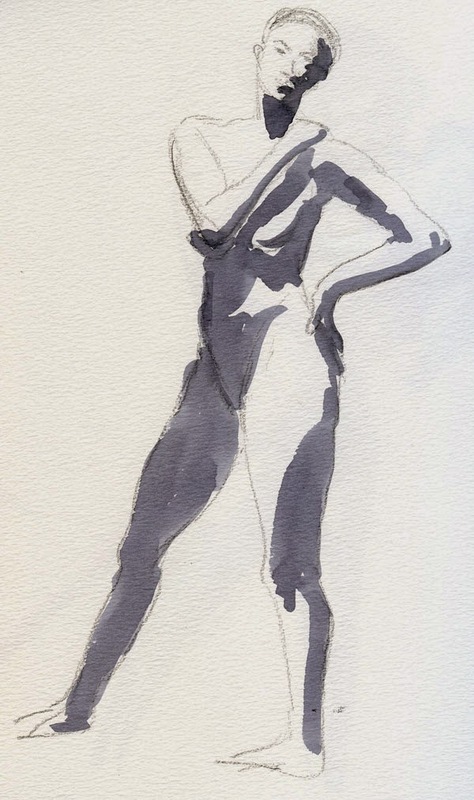 My very first one-minute sketch makes our slender model Amelia look like a sumo wrestler! By the end of the two-minute poses, she was looking a bit more proportional. I was warmed up by the time we got to the 10-minute poses, and by the last 20-minute pose, I felt like I was finally ready to draw. It’s humbling to know that without regular practice, I get stiff and creaky immediately. But it’s also reassuring to know that after a brisk walk around the block, I can get my bones moving again.